Leigh Miners can trace their roots back to 1966, when players from Astley & Tyldesley linked up with the disbanded junior section from Hope Rangers to form the new club based at the Miners Welfare club on Twist Lane. Back then the team played in the Warrington League, and Twist Lane was a far cry from the present set-up with no changing rooms or other facilities on site. Players from that fledgling side included current Club President and physio Rod Raines and committee man Harry Westhead. The team moved into the North West Counties League in the 1970s and enjoyed terrific success as a team packed with internationals including the Dowling twins, Rod Lewis and John Roberts won a record number of Premier Division titles, Lancashire Cups galore and appeared in three National Cup finals, winning the inaugural trophy against Latchford and again against Lock Lane in 1983. They also came close to the biggest Challenge Cup upset of all time, leading holders Warrington at Wilderspool with time running down, before a controversial late score saw Wire through. In 1986 the team became founder members of the National Conference League and remain one of only two sides never to have played outside the top division of the amateur game’s flagship league. Early success was limited, although Miners won the short-lived Conference League Cup. In 1999, under coach Ian Taylor, a team packed with stars including Richard Henare, Mark Meadows and Andy Collier beat the then-professional Bramley at Headingley in the Challenge Cup third round, but in the league the team were struggling until the appointment of former BARLA coach Warren Ayres in autumn 1999. 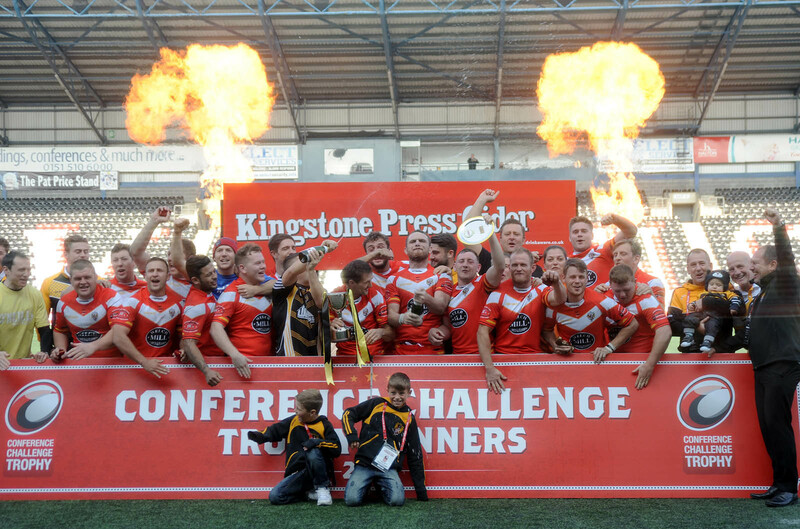 Under Ayres Miners reached the inaugural National Conference Grand Final in 2002, narrowly beaten by West Hull at Spotland, and since then Miners remain the only club to have appeared in all but one series of play-offs to date, a unique record of consistency. In 2005 the team won the Grand Final, defeating Wath Brow at Orrell in what proved to be Ayres’ last game in charge. His assistant Winston Sarsfield took the helm, and guided the team to third place and the National Cup final in his first season. In 2006-7 with a team largely composed of graduates from the club’s under-18s side including Scott O’Brien and Aaron Gorton, Miners claimed the Minor Premiership but agonisingly lost out in the Grand Final to Skirlaugh. That was repeated last season, this time East Hull the victors at Featherstone in the Final, although the club did get a final chance to play on Hilton Park with the Challenge Cup game against Whitehaven, and Martyn Ridyard was named NCL Player of the Year. In 2008-9, with a team including eight players from the victorious under-18s side of 2007-8, the team maintained their record of appearing in every top six series of play-offs, and were top amateur team in the county, with their fourth place finish. The season culminated with two players touring the South Pacific with the BARLA international side, another touring Ukraine with the under-23s and four players going on the youth tour of Australia. In 2009-10 the club maintained its record in the play-offs with a fifth placed finish and also became the first amateur team to play on the new Leigh Sports Village ground, coincidentally again against Whitehaven! The team fell one game short of the Grand Final following a heroic play-off charge that included wins at Wath Brow and Skirlaugh. In 2009-10 the club maintained its record in the play-offs with a fifth-placed finish and also became the first amateur team to play on the new Leigh Sports Village ground. In the summer era led by joint coaches Paul Whitworth and Allan Coleman they finished Treble Champions in 2015 and reached a record 4th round of the famous Challenge Cup in the clubs most successful season.